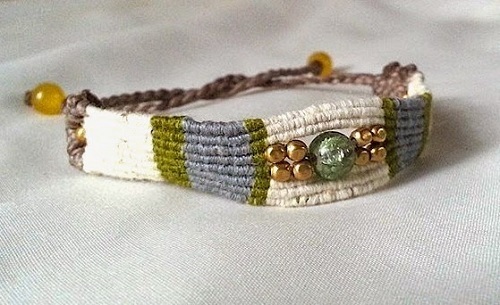 This tutorial by Ecocrafta Macrame is a standout. The Thai designer uses some beads as the focal area and used color blocking to make the design pop! What makes this design so effective is the use of cotton thread as the working thread. So it is more time-consuming as the thread is so much finer than regular cord. It helps that the wider portion of the design does not encompass the whole wrist. If you do not like the tie fastening style, consider shortening the square knotted ties and make one end a loop. She also sells a huge variety of waxed cotton in her Etsy shop, HonnVillage. Any one of these books would be a pleasure to have! They are sparkling, innovative ways to grow in many artistic fields. They all have a new way to update and make jewelry fresher. I think these are very exiting!